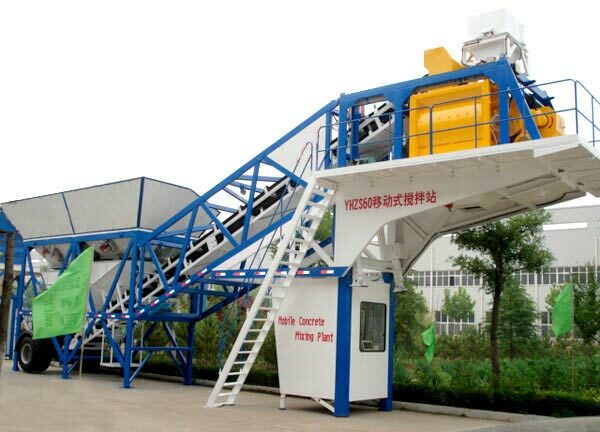 60m3/h Mobile concrete plant also called YHZS60 small concrete batching plant made by haomei machinery has good quality and low cost. YHZS60 modular mobile concrete plant is special construction concrete equipment designed by our company as module. this mobile concrete plant is applied for airport way, wharf, road, bridge and so on, It can also be used for the large and emergency repair construction operation. It can be installed quickly on site. This mixing plant is consisted by mixer, batching system, feeding system, weighing system, cement silo, screw conveyor and all the necessary equipment, and they are designed as module .So We can deliver YHZS series concrete plant easily by container, and install quickly on site and get it to run without debugging. This equipment has the characteristic of high automatic, well mixing, high productivity, high flexibility, convenient operation, and good stability.